There is no mistaking Mac McDonald, owner and winemaker at Vision Cellars, in overalls and straw hat on his vineyard in Sonoma County–or anywhere else for that matter. Overalls and a straw hat is the daily uniform for this winemaker from a small country town in Texas. His father was a moonshine maker, but Mac quickly fell in love with wine, after tasting a “phenomenal” wine from Burgundy at the age of 12. From then on, he was committed to becoming a great winemaker, moving to California in 1963 and learning the craft of winemaking in California vineyards until he started his own in 1995.The pride he takes in making great wine is palpable as you talk to him about his wines. He does not hesitate to reference awards his wines have received or the Presidents who have served his wine in the White House. But he is not so proud that he doesn’t take the time to elevate other people’s wine knowledge, especially African Americans. Indeed, his wife has to work hard to limit the amount of time that Mac devotes to mentoring aspiring winemakers and teaching wine enthusiasts about the winemaking process. She complains that he gives so much time and energy away that he has little left for himself and his own projects. In addition to mentoring the next generation of wine industry leaders, he is also the founder of the Association of African American Vintners—comprised of African American wine producers. 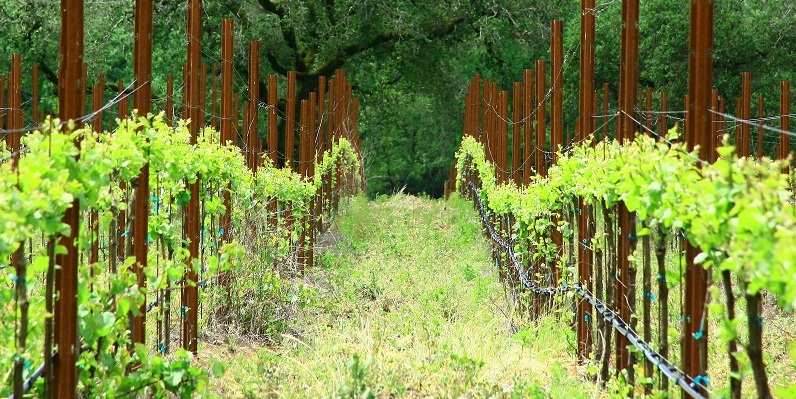 Vision Cellars is situated in the Russian River Valley American Viticultural Area (AVA) of Sonoma County, California. Specializing in Pinot Noir, Vision Cellars produces 1,800 to 2,400 cases of wine annually. Mac’s wine making philosophy gives precedence to the expression of the terroir of each individual vineyard from where the grapes are sourced. His old world style Pinot Noir—higher acidity and less fruit forward—has developed a reputation for consistent, high quality. 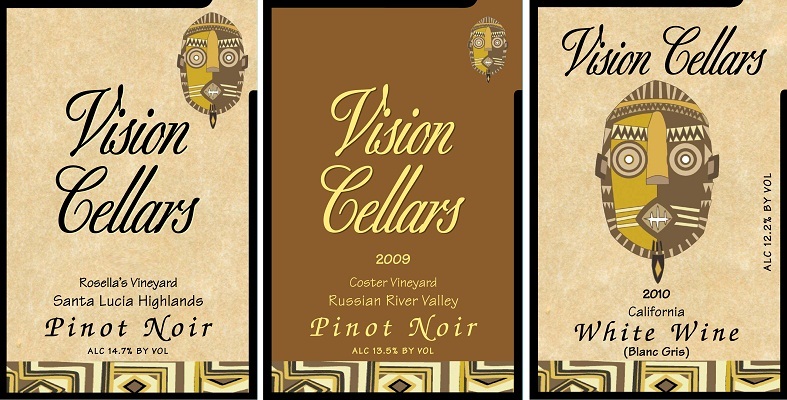 Vision Cellars’ Pinot Noirs are very versatile, pairing well with a wide variety of foods from raw oysters to burgers and fries. You can find Vision Cellars on the wine lists of a limited number of high end restaurants or for purchase online directly from Vision Cellars. Vision Cellars wine club is often full, but now is your chance to join, as they currently have a few spots open. Wine now matches beer as the most consumed alcoholic drink in America. More and more people are drinking wine with dinner, at home, and in social settings. Although the numbers are still relatively small, there are a number of African-Americans producing and selling wine. As you think about having a glass of wine tonight or this weekend, please consider trying a wine produced by an African American or patronizing an African American owned wine shop. On that note, BedVyne Wine (an African American owned wine shop located in Brooklyn) is giving away a bottle of wine and a tote bag to one randomly selected reader who “LIKES” BedVyne Wine on Facebook and leaves a comment below. A boutique wine shop in the heart of Bedford Stuyvesant, Brooklyn. We offer a large selection of carefully curated wines from all over the globe. Our wines are arranged by taste, not by region, so our customers are able to enjoy wines from many regions that will fit their palette. Cheers! CONTEST DETAILS: Contest starts Wed., Dec. 7, 2011 and ends Wed., Dec. 23 at 10 p.m./PST. Winner announced on Wed., Dec. 28th. Contest open to residents of the continental United States, excluding Alaska, Hawaii and U.S. foreign territories over age 21. No additional purchase or shipping expenses are necessary. Prize cannot be exchanged. If wine shipping is restricted in your state, you may be ineligible to win. Must provide an email used only to notify the winner and for shipping information. Janelle is the Founder and Editor of The Cork Chronicles, a wine blog engaging wine novices and connoisseaurs alike with wine reviews and tales of her personal wine tasting experiences. She is a sought after wine writer and educator. Please contact her on Twitter @corkchronicler or via email at janelle@corkchronicles.com. Thanks you for this post. I’ve been planning a trip to Wine Country (Sonoma) to visit different vineyards with my mother and sister. I’m definitely adding Vision Cellars to the list I’m working on. I’d love to try this wine! What a great story. So glad to see them getting good exposure! i have heard of this vineyard. i really hope to visit one day. Delightful! I have had a couple of personal encounters with Mac and you are absolutely right. He is so generous with his wisdom. I contacted Vision Cellars to ask a question about their upcoming events in North Carolina. Guess who answered…Mac. Forty minutes later I had become a more enlightened wine drinker. Congratulations! You are the winner of a free totebag and bottle of wine from Bed-Vyne Wine Shop in Brooklyn, NY. Please forward your mailing address and full name to sanura at myliferunsonfood.com. Lovely post. It is a fantastic human story and wonderful to see such dedication. I wish I could try the wine but there is about 10,000 miles between us. Wow this was a great article. I’ve never though to seek out African American wine makers but now I’m intrigued. Maybe I will plan a trip to vineyards in the near future. Thanks for this! This is great. I was not aware of this and yet visited the wine country every year for years. Thanks to Twitter you got some exposure. This entry was posted on December 7, 2011 by Janelle Carter in 2011, business, contest, Ujamaa, wine and tagged Association of African American Vintners, Bed-Vyne Wine, Brooklyn, California vineyards, contest, CorkChronicles.com, Janelle Carter, Mac McDonald, Pinot Noir, Vision Cellers, wine, wine shop.